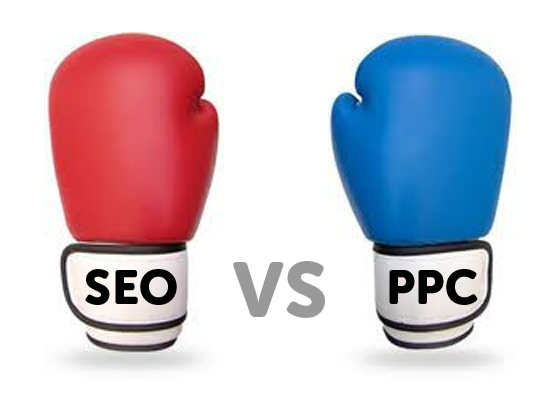 Home » Pay-Per-Click Vs. SEO. What is better for your business? The questions always comes up when speaking with various different types of business owners and companies. It is a very valid questions. When it comes to advertising your business you should ask this question, but you should also understand the difference and know the pros and cons of both forms of Internet marketing. One of the biggest problems is that most Internet Advertising Companies are not telling you what is best for your business, but more what is best for their bottom line. So a lot of people want to know, what is the answer to this questions? How much more business can you actually handle? 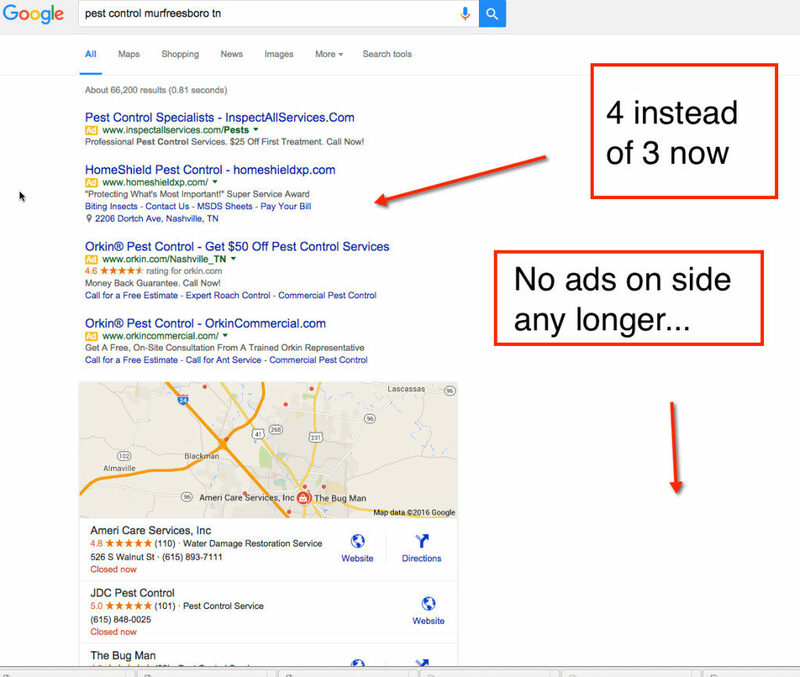 You will see that on Google, The ads will show up in the first 3-4 spots at the top of the page. These are google Adwords “Pay-Per-Click” listings. Below that is their current google maps set up, showing 3 listings and giving the option to expand to more. Below that would be your “Organic Listings”, This along with the google maps listings is were SEO or Search Engine Optimization will play its part. Pay-Per- Click (PPC) is essentially a bidding system for keywords. You pay every time someone new comes to your website via a search for one of the keywords in your campaign. The clicks tally up every time someone clicks on one of your ads for a keyword and goes towards your budget that you set, hence the dubbed name “Pay-Per-Click“. There are many factors like Quality Score, Cost Per Click, Broad/Exact, Click Through Rate, and more that come into how your ads show up for keywords, but that can get a little confusing so we will keep this simple. With PPC, you set your daily budget and that is what you will spend. Once you exceed your daily budget, your ads will not show that day. Search Engine Optimization (SEO) is your “Organic” search results. With SEO, you are not paying per click every time someone clicks on your website for a keyword, but rather showing up for these keywords by being the one of the most relevant indexed matches for the keywords being searched for. There are many factors that come into play when making your website relevant for numerous keywords in searches like: Content, Links, Social Media, Social Bookmarking, Blogging, and more. Again this stuff can get very confusing, so is best to mention them, but not explain them. With SEO your normally get charged a flat monthly rate for the labor involved with moving your ranking up. The longer you are doing SEO, the better results you should get, but you must not do anything that will get you penalized or you will lose your rankings. In conclusion: As you can see SEO is more of a long-term strategy but it does pay off in the end because as time goes on you will rank for more and more keywords and your ROI will get better and better. PPC can be a short-term strategy but can also be used in addition to your SEO program or as your sole source of leads online. I usually suggest to clients that are just starting to market themselves online to do a combination of both. Start on your SEO as soon as possible because the longer you wait, the longer it takes. If you can do PPC in addition to your SEO program, that will put you in a good position to win, because it will at least get you some immediate return on your investment from the PPC while your SEO rankings are moving up. Some clients will stop doing PPC once they start seeing a return from your SEO, but lets face it, if it works, continue to do it! If you are seeing results from your PPC and SEO and it pays for itself, why ever stop??? Like I said earlier, it really all depends what situation your business is in and what you budget it, this will determine what is the best approach. You also want to make sure that you have a good updated mobile responsive website. This will help you not only help you to be up to par with Googles standards, but also with conversions. It is also important to be active on your social media accounts. Online marketing is an overall strategy now, and it must all be done right together. If you needed some support with your digital marketing campaigns I have heard that Whitehat provide some very detailed agency guidelines about what works and what doesn’t.